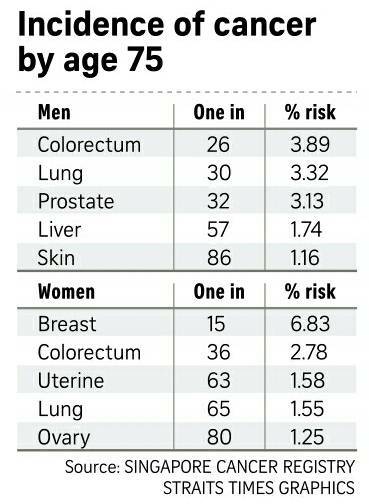 Increase of incidence of cancer goes hand in hand with an ageing population. The hard facts aka numbers help one put in perspective how the dice is loaded. I have often across articles which suggest that 1 in 4 of us will have cancer in our lifetimes. At the personal level I think I have too many friends who have had a brush with cancer. On the other hand cancer among my relatives seem much rarer. I am not even thinking about my cousins but uncles and aunties. 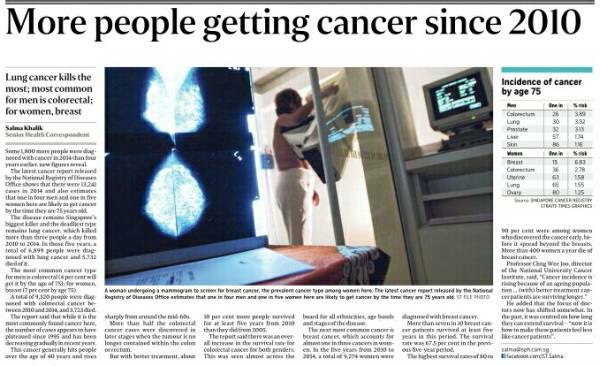 "Increase of incidence of cancer goes hand in hand with an ageing population." - this is a sweeping statement, unless you can proof it with "hard facts" correlating it with actual age of cancer patient. Please be helpful, this is a serious illness, it has grievous and lasting impact to a person and their love ones. Do them a favour, please don't muck around with statistics, thankyou !! Thanks for the links you provided especially the first one which I have not yet come across. Your last paragraph makes me wonder if you or a loved one has been touched by cancer. I have some young friends fighting breast cancer and another one in her twenties with advanced colon cancer. They are often on my mind. Recently I also ponder over Dr. Michael Leong death due to colon cancer. Do note that they are not at this time recommending any changes to how colorectal cancer is screened.